You guys, I'm totally still a newbie when it comes to this SAHM biz. However, since I've worked part-time for the past 2.5 years I've picked up things along the way on the days that I stayed home with the kids, and I have definitely learned a lot this past month that I've been home full-time with them. Here are some of my top tips that work for me and the kids at this particular stage (and season..since it's summer) in life! +GET UP BEFORE THE KIDS DO TO GET YOURSELF READY! Getting out of the house at least once per day is big for us and keeps me sane. At the end of every week I look up local events or places (some free, some not) to take the kids during the next week. Spend time researching fun places you can go with your kids! I read a ton of local blogs // follow pages on Facebook to see what they have going on. I will look at the weather and what other things we have going on and plan out activities for each day. 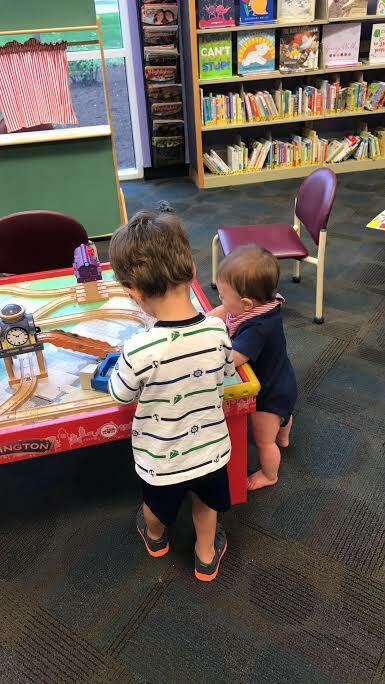 Lately we've been going to story time at the library so I know ahead of time what day that will be, and then I will just plan other fun things to do too. My go-to places that I've been (or plan to) take the kids are: the park, splash pads, the zoo, play cafes (we have a bunch of these here that are geared towards toddlers-you pay a fee but they are awesome and have so much for the kids to do! ), trampoline park, Chik-Fil-A for a special lunch out and to play), or just get out of the house to go on a long walk! You all know it can take forever to load up the car and get the kids out of the house, but it's worth it! Also, all of those places I mentioned are also a great way to make mom friends and socialize, too. Both my boys thrive off of a good routine. They like to know what to expect next and it makes our days flow smoother. For example, after breakfast I typically read books with them. When Grayson takes his first nap, I usually will let Cam play outside on our deck or in our backyard. While I make dinner at 5, I put on a show for Camden (and I don't feel guilty about it-it is literally the only way I'm able to cook!) This really helps ALL of us. +MAKE THE MOST OF NAP TIME! My number one goal since I had Grayson was to try to have his longest nap be at the same time that Camden takes his nap (which is from 12-230ish.) Luckily for me this plan worked out and he sleeps when Camden takes his nap, and often sleeps a little bit later than him until 3 or so. On a good day, this gives me at least 2 hours (minimum 1.5) to get things done around the house, or to just SIT DOWN without interruptions. Of course there are days that I am flat out exhausted and choose to sit on the couch for a lot of it, but most days I really take advantage of this time that they're both asleep because it is so hard to get things done when they're awake and I really try to be in the moment and play with them! During their naps I will pay bills, get a workout in on the treadmill, do laundry/clean, organize the house, do a Kroger click list order for groceries, meal plan, etc. I legit run around the house like a crazy person, as I'm sure do many of you! My first week home I remember picking up the house during the day constantly. I would spend so much time in the kitchen or putting away toys for them to just be taken out an hour later. IT WAS EXHAUSTING and it took time away from actually hanging out and having fun with the kids. Now I've learned (forced) myself to just let the mess be (aka toys everywhere) and only pick up at nap time and at the end of the day. I also try to involve Camden and have him help me pick up! I've learned to give myself a little grace and know that a dirty house means fun is being had, and one day I know I will miss the mess. This is only the beginning of my SAHM journey, so I'm sure I will learn a lot more of the next couple months! Honestly some days I feel like I have no idea what I'm doing but the next I feel like the best mom on the planet. That's just how motherhood goes...right? PS: If you're a rookie SAHM and have other helpful tips to share or things that work best for your family, I would love to hear them!! Great post. I always love getting perspective from women who went from working to being SAHM's. When we have kids, I'm considering staying at home for a while, but I have a serious internal struggle going on about putting my career on hold as well. Thanks for these posts! Love reading them. Getting out of the house, YES YES YES! Love the idea of planning activities the week before, I'm usually googling things in the morning, trying to figure out what we can do that day, ha! So glad you're loving being home with your boys! !